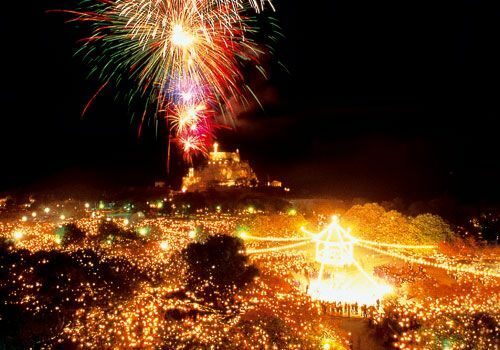 Easter is the most important holiday in the Greek Orthodox Religion and for this reason it has the most poignant ceremonies which begin on the Saturday of Lazarus (the Saturday before Palm Sunday) and end with Easter Sunday and the lamb feast. Holy Thursday is the day for dyeing eggs red. The egg is a symbol of life while red is the color of life. One of the most beautiful of all Easter traditions is when after the Holy Thursday liturgy women begin to bring baskets of freshly picked flowers to the church and spend the whole night adorning the bier of Christ so that it will be ready for the funeral procession. Holy Friday is the day of the “Epitaphios” or the funeral procession of Jesus Christ. Flags at homes and government buildings are set at half mast to mark the mournful day. 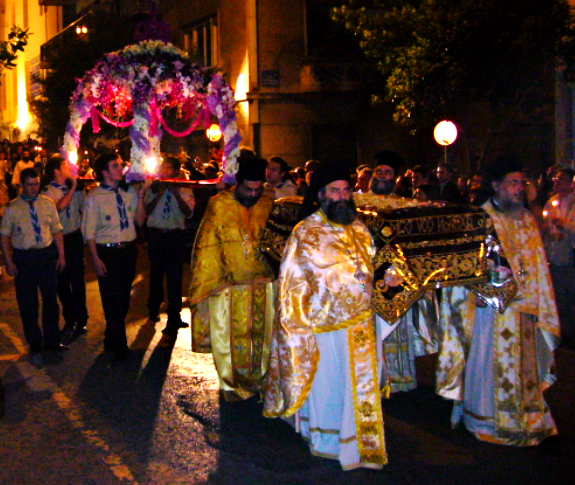 The Procession of the Epitáphios of Christ, the Ritual Lament that has survived from Homeric times, mourns the death of Christ on the Cross with the symbolic decorated coffin carried through the streets by the faithful. Late at night the bier is carried through the streets preceded by a band playing solemn music or a choir singing the traditional funeral hymns. They are followed by the cantors, the clergy, women bearing myrrh, the altar boys carrying the liturgical fans, scouts and the people of the city, who sing the hymns throughout the procession. All along its route, people scatter flowers and perfume on the epitaphios (bier), holding lighted candles in their hands. Emotions are strong, followers hang their hands in silence and it is difficult for anyone, even passers by, to remain neutral. There is something very special about this night. The air is full of the scent of flowers, burning candle wax and myrrh. It is almost intoxicating. Feelings of melancholy are intertwined with peacefulness and one’s heart opens to accept the love of Jesus Christ and his sacrifice for mankind. Holy Saturday is completely different. It is a day to rejoice, a day of new hope and a symbol of eternal life. Church bells can be heard ringing from all directions, fireworks light the sky and the beautiful hymn of “Christos Anesti” (Christ has risen) is on everyone’s lips. Hundreds of worshipers in the streets with their families, holding their candles, lit at the stroke of midnight with the holy light from the tomb of Jesus in Jerusalem, kiss each other joyfully saying “Christ has risen”. If you are in Athens during this enchanting time and would like to take part in the religious ceremonies you may go to the Church of St. Catherine (Agia Aikaterini) in Plaka on Lysicrates Road near the Hotel Ava, The Athens Cathedral on Mitropoleos Street, the Church of St. Irene (Agia Eirini) on Aiolou Street and the Sotira Lycodemos Church on Fillelinon Street, known as the Russian Church. Easter Sunday marks the end of the 40 day Lenten period and is the big feast day where family and friends gather around the main attraction which of course is the “ovelias” or the lamb which is usually grilled over an open spit outside. The weather is usually mild in Greece this time of year and offers the best incentive to escape the city for a few days in the country or one of the beautiful Aegean islands. Learn more about the Greek Orthodox religion, customs and traditions by taking one of our specially designed Easter tours! “Kali Anastasi” and “Kalo Pascha” to all! This entry was posted in Greek Easter, Greek Tradition and tagged culture, greek culture, Greek Easter, Lent, orthodox easter. Bookmark the permalink.